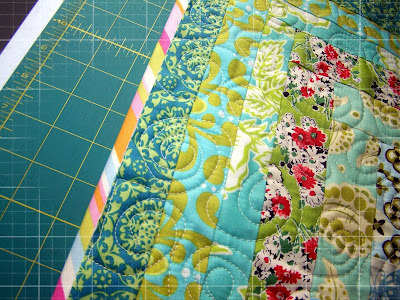 It's binding time for my DQS7. I'm beyond happy with how it all turned out seeing as how I just started cutting widths of strips and hoped that it would turn out an okay size. I even had to make me one! I'm looking for feedback on the following binding choices. 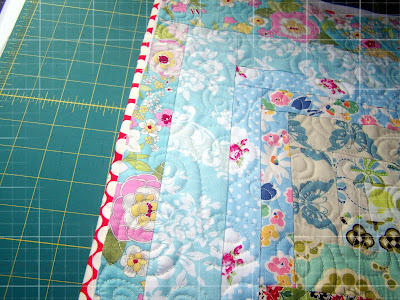 I want a little something unexpected in the 'framing' of the quilt. Wanted to get away from the blue/green theme. Since I'm a sucker for orange, I had to try this out! My partner didn't say they hated orange, so I should be safe, right? I do love a little black in all things. And add that polka dot......now I'm torn. Or I could go a little safer with the bias stripe going around. I love and adore this Amy Butler dot and want it in everything I do!! Do I want it for binding?? So, if you have any opinions on what color binding I should use, please share. Although my husband would tell you that I never listen and that I already have my mind made up. Maybe it's just a test. It's definitely that little pop of orange. It's wonderful! Too cute! I like the red. It seems like it "ties in" a little more to the rest of the quilt. But really, all of them are great! The black or red. They both look perfect and the dots are just right. Either would be beautiful. In order of preference-Red dot, black dot, orange, stripe. Too many choices makes it tough to pick! I like both the orange and the red/white. Without seeing the rest of the quilt I'd have to say the red. I would go with the orange but the red seems a little more "safe" ;). I'm a sucker for polka dots, so I like the black with polka dots or the red amy butler full moon dot fabric. It all looks cute though! My vote is for the Amy butler dot! My first choice is the black dot--it is striking! The Amy Butler dot also looks good! Anything you do will be fine as long as you like it!!!!! After looking at your choices several times, I don't think you can go wrong with any of them. But, for some reason, I vote black! I vote red or orange. The bias stripe is my very least favorite - i don't think it looks good at all! The AB red dot is adorable. Love it. Bias one is pretty good too. I like the unexpected myself. Love the black, really frames it! I like the b&w polka dot best, Amy Butler red and white second. Please show and tell more about this project; it looks interesting. I vote for the orange. Black with the dots..for sure Des....no question about it. I vote black. Runner up would be the red, I think. I like the red Amy Butler dots. red too match the red flowers in the green print. definitely red. there's no other option. I love the orange with the fabric on the first photo, but I prefer the black with the lighter blues. (Are all these fantabulous prints on one quilt? I need a full shot please!! )I definitely don't like the bias stripe or the red polka dot (sorry hehe) so I think I would say the orange. 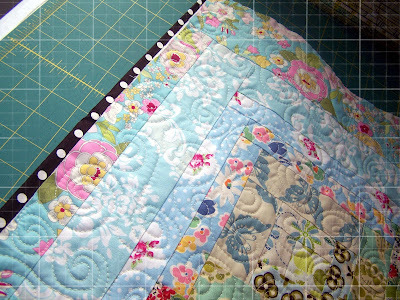 Love all this quilt stuff and still believe I will one day win one of your Thursday giveaways. And even if I don't, that's okay, too. At first I thought the red dot, but I think I'd pick the black. I think the answer is always black for me. 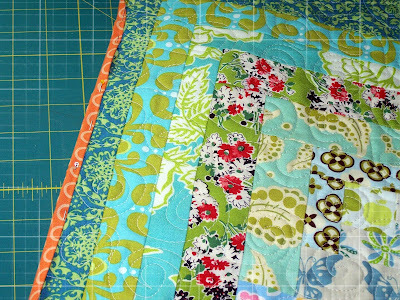 That sure is super machine quilting you've got going on there! I actually like all the choices, but I'm leaning towards the black polka-dot. Love love love the black dot! If I'm not too late with my vote, it goes to the black and white polka dots. But any of them will look fab! Cute quilts. I really like the orange, but I think I would pick the red dot it's fab. 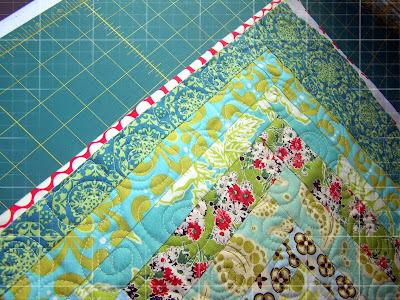 I think the red with white polka dots is the most striking and works with the quilt the best. So so cute. I love the fabrics and love how they come together. Orange! 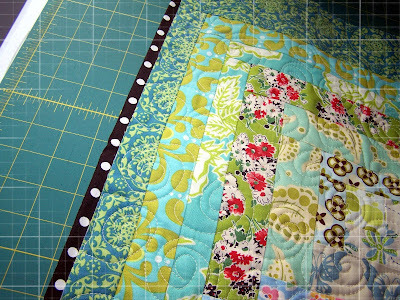 love it and great machine quilting there! I love the red and white dots. It makes the red in the quilt pop out nicely. I also like the black though because it is classic. I didn't read all the comments, so I don't know which is ahead, but personally I adore that Amy Butler dot. I think the orange really picks up the little pops of orange and yellow in the fabric! It's probably a little late...but I like the orange. I love the orange and the stipe! Red dotty fabric is the best, though the stripe is not bad either. My vote is for the orange! Love the quilt! You probably have the quilt bound already but I say red. I loved the orange first. BUT the black really does something for me! I hope you decided because I could be easily convinced to use any of them. Can't wait to see what you decided on. For me, the black and white just pops the whole thing! I love the black. It makes the whole quilt POP! Loving the polka dots. Either color looks great. 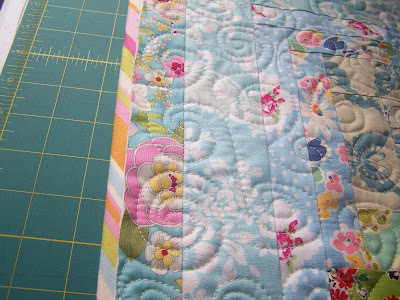 it's so fascinating how that tiny strip of binding makes such a big difference! i like the black polka dot but didn't see a lot of black in the quilt, just to throw in a twist--how about a dark brown polka dot? the orange is really nice too. can't wait to see what you decide! I love the black and white polka dot! What did you decide? I like the red dot. black and white polka for sure! It looks fabulous!